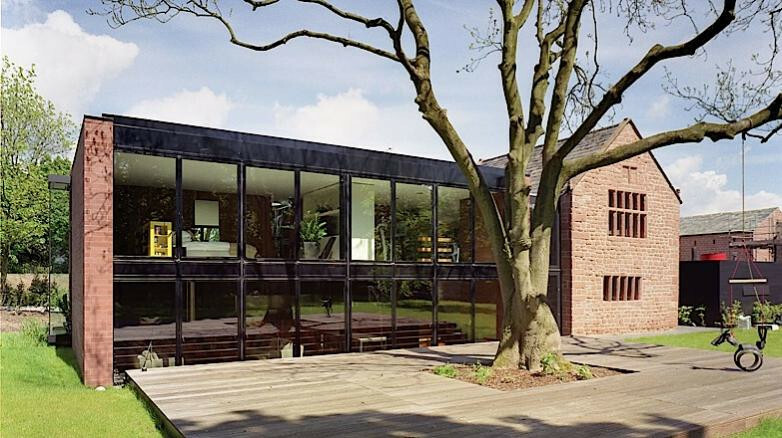 Oak Farm in Liverpool was shortlisted for the 2005 RIBA Manser Medal prize. A private development by architect and co-founder of Urban Splash, Jonathan Falkingham, it consists of two buildings in one: a restored Grade II listed 17th century farmhouse linked via a two-storey glass walkway to a large contemporary sandstone construction. HistoryJonathan and an associate bought the Oak Farm site which had been highlighted in a ‘stop the rot’ campaign by the Liverpool Echo. As well as the award-winning farmhouse, 3 more houses were created from late 18th / early 19th century outbuildings and a fifth is new build. Oak Farm is thought to have been a late medieval yeoman farmstead whose original open hall had long since disappeared but a service wing, added around 1660, was stillstanding. Built of local red sandstone, this was to be the keystone of the award-winning design. Urban Splash and architects shedkm appointed Maysand to produce a schedule of works, then as masonry contractor for the project. “We had anywhere between two and six craftsmen on site for almost a year,” says Maysand’s masonry surveyor, Mick Fowles. “Some elevations had to be chemically paint stripped, and all were cleaned with a mild chemical solution (to an approved sample) prior to being dismantled. Then the farmhouse was literally taken down, stone by stone, each one recorded and stored on a pallet. The farmhouse was rebuilt exactly, except for an opening on one elevation for a full height glass corridor to link the historic and the new build parts of the house. Maysand also built the external and internal stone façades of the extension around a block work backing structure. The timber structure was left in place during the dismantling and repaired and cleaned by Maysand timber experts, so that it now forms a visual feature in the upstairs rooms.